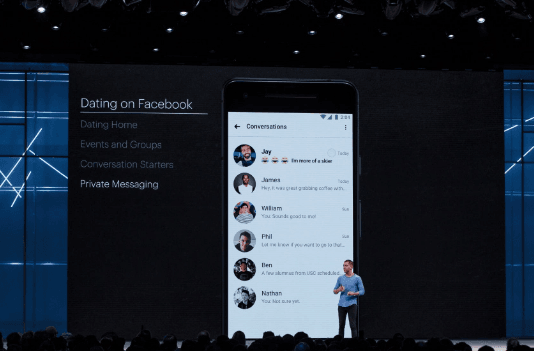 Facebook, at its F8 developer conference, made a surprising announcement that they are developing a dating service. The Facebook dating service would enable a user to create a separate profile other than the regular Facebook profile that they have. Thereafter, the social networking giant would feed them with matches based on their preferences, interests and mutual friends. Explaining the rationale behind the Facebook dating service, CEO Mark Zuckerberg said there are over 200 million people on Facebook who show themselves as “Single.” “So clearly there’s something to do here,” he said. Further, Zuckerberg cleared that with the dating service, the company wants to ensure that users find a long-term match rather than casual hookups. However, how the social networking site would make that happen is not known yet. Talking of the new service, Chris Cox, Facebook’s chief product officer, said that the Facebook dating service “mirrors the way people actually date, which is usually at events and institutions that they’re connected to.” Cox stated that they got the idea of having a service like this when several couples told Zuckerberg that finding the perfect match was one of the most important things that happened to them on Facebook. So, if you are interested in the Facebook dating service, here is how you can use it. First you need to click the heart icon on your Facebook profile, this would land you on the “dating home” page from which the dating profile page can be set up. This page would not be visible to your Facebook friends. You will be able to check the nearby events and groups that interest you. Once the profile is complete, it would be shared with others going to the event and groups that you expressed interest in. Additionally, a user would be able to see others who would be attending the same event and also check out their profiles. If you find someone of interest, there is an option for a private chat as well. The other person, if interested, can message in a private message box connected to the profile. You can also interact in that message box. As of now, it is not known if the social networking giant would charge for the service, or if it will be free. Other dating apps charge users for the premium service. Facebook is known to encroach on the idea of a different service – something it has done to Snapchat – and then up the bar to make it impossible for smaller companies to follow. With the Facebook dating service, the company could taste success like no other app, given the huge mine of data that it has of the users. According to a study by researchers at Stanford University and the University of Cambridge, the amount of data that Facebook has can be used to understand the personality of an individual a lot better than from personal knowledge of their family and friends. One of the data scientists at Facebook even stated that he could predict with fairly good accuracy about how long the relationship among the Facebook users would last. So, if Facebook makes up its mind to harness the data and analytical competence to bring together people with similar personalities, interests and values, the company may even succeed in finding them their perfect partners, even better than who they would have picked themselves. For users, a Facebook dating service means easy management of their dating profile, as well as, social profile. For Facebook, it would be another feature to encourage users to spend more time on the platform. However, it will be interesting to see if the dating service will interest teens, who have been moving away from the platform. Speaking to MarketWatch, Meredith Golden, a dating coach based in New York City, said that the platform would play cupid for mostly the divorcees and users above 40 who do not look up Tinder to get themselves a match. Even with the users above 40, it’s a lucrative segment for Facebook. According to the Pew Research Center, online dating is growing popular among 50s and older.